Microwave carts are useful storage solutions as well as mobile workstations. They help free up space in cramped kitchens and provide a portable cooking work area. There are a bunch of different styles of microwave carts on the market today. Some resembling full portmanteaus, but the minimalist Whitmor Supreme is our top microwave cart pick. It is a 21 lb. kitchen cart that includes a removable wood top, 1" increment adjustable shelving, chrome hooks for hanging kitchen utensils and dishtowels, locking caster wheels, and an attractive wood and chrome design. Users provide solid feedback for this microwave cart- they say that while it is compact in build you can still fit a lot of items on it, which helps to free up cabinet and counter space tremendously. Reviewers also commented that it moves pretty smoothly, even on carpet, and assembly takes about 10 minutes. One user who lives in a cramped New York City apartment says that for the longest time she had kept your microwave on her kitchen table where it was a huge eyesore. She purchased this Whitmor microwave kitchen cart and now she is able to store her food processor, Cuisinart blender, a rice cooker as well as her crockpot all on the microwave cart, which gives her a ton more counter space to cook and create in her small kitchen. In terms of how this microwave cart is structured, it consists of three separate shelves, the bottom two of which are height-adjustable, which means that you can customize the cart to a great extent to fit different kitchen tools and accessories into it. These microwave and kitchen carts are great storage solutions and a convenient way, as well, to have a mobile workstation if you have a larger kitchen and need to port about your different cooking tools and equipment. Let's take a look at the 5 best-selling microwave carts on the market today and see how they compare. 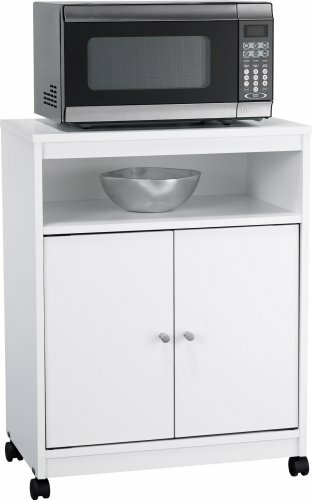 If you don’t have enough space in your kitchen, you might want to consider this microwave cart offered by Altra Furniture. Users love that this kitchen cart table is easy to assemble, sturdy and that they get extra space for storage. However, some do note that the parts don’t fit together well, and the doors don’t align. The Altra microwave kitchen cart has a large top surface that can hold a microwave up to 40 lbs, one open shelf, and a storage place behind two closed doors. It weighs 35 pounds, and the four bottom wheels make it easier to move it around. Overall, it seems like a good choice if you want to have some extra space in your kitchen for a reasonable price. Users have a mixed reaction regarding this kitchen cart on wheels. One user shared that she managed to put it together with ease following the instruction and her microwave fits without problems. A pleased buyer states that the bottom cabinet can hold a lot of pans and pots and that it seems very sturdy and durable. Another purchaser comments that the microwave cart works exactly as he expected, and it’s perfect for his small kitchen, but states that the wood material is fragile. An unhappy user comments that the brackets that should hold the boards together are cheaply made and bent, so it was difficult for him to assemble the whole thing. Some other buyers have complained that the back is made from cardboard, so they had to reinforce it with wood. This Whitmor supreme microwave and kitchen cart is well-built, stylish, and portable so it’s a good choice for anyone with limited kitchen space. Users love that this rolling kitchen cart is sturdy, easy to put together and that the wheels allow them to move it wherever they want easily. However, some do note that the shelves don’t stay in place and slide off. With a steel frame and a weight of 20.9 pounds, this microwave utility cart has a removable wood top, two adjustable shelves, four chrome hooks, and heavy-duty locking wheels. Overall, it seems like a sturdy and useful tool for storing your kitchen items. Generally, users express very positive opinions regarding this Whitmore kitchen cart with wheels – they praise its durability, sturdiness, and versatility. One user shares that the cart is compact, but she can fit a lot of items in it, and that it moves smoothly due to the caster wheels. 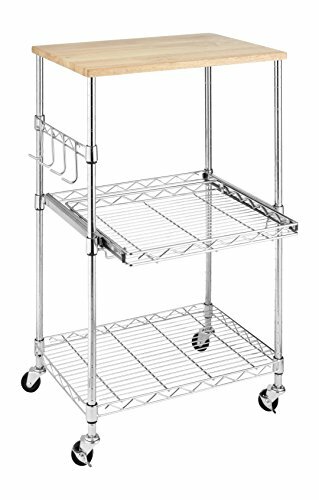 A pleased customer states that this stainless steel cart is very easy to assemble, and it’s convenient that the height of the shelves can be adjusted and the bottom one can be removed for extra space. Users use this rolling storage cart not only for microwaves, but for faxes, printers, toasters, blenders, and even as a nightstand. However, some customers have complained that the cart wobbles, the wheels wouldn’t lock properly and they would break if you put heavy objects on the stand. Some also state that it arrived broken. 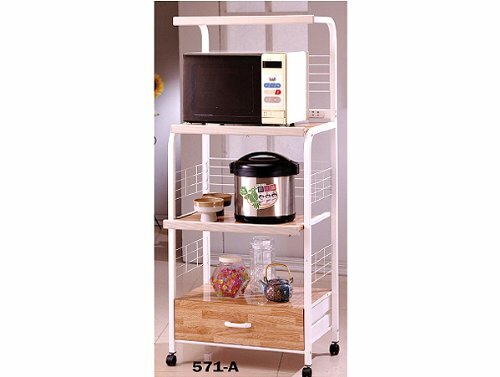 If you are wondering how to get some extra space in your kitchen, you might take a look at this white microwave cart stand offered by Hodedah. Users love that they can roll it around the kitchen and that it saves them a lot of space. However, some do note that the assembly instructions are not very clear. 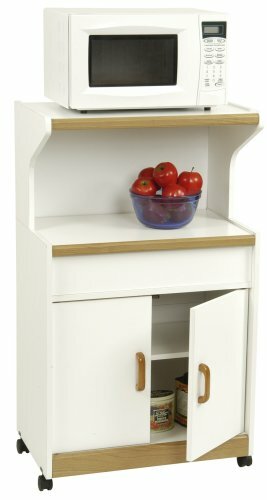 Made from high-quality compressed wood, this kitchen cart table has a middle shelf for the microwave, a top shelf for other appliances, a drawer, two doors on the bottom for extra storage space and four wheels for mobility. Overall, it seems an efficient kitchen cart for a reasonable price. Users are mostly positive in regards to this portable kitchen stand. They are happy with its functionality, versatility, and mobility. One user shared that he managed to put it together for an hour and he used it for his coffee machine and microwave without any problems or worries that it might fall apart. For him, the drawer was a very nice addition since it allowed him to store various kitchen utensils, and he was extremely pleased with his purchase. Another pleased purchaser states that he would gladly buy another one since this portable cart on wheels seems sturdy, very well-made and looks great in her kitchen. She only complained that the package didn’t arrive with all the necessary hardware. Some other customers express their dissatisfaction that their kitchen rolling stand arrived with chipped shelves or that it was smaller than they expected. This deluxe microwave stand offered by Altra is stylish, functional and could be used to solve your counter space problems. Users love the beautiful, compact design, the white oak color, and the fact that they can use the bottom part to store various knick-knacks. However, some do note that this microwave kitchen stand is very difficult to assemble. With a top shelf that can hold up to 35 lbs and a centerpiece for extra storage, this kitchen utility cart has a bottom cabinet with one fixed and one adjustable shelf, plus four carter wheels for mobility. But overall, it seems a low-quality product with assembly problems. Users have mostly a negative attitude towards the Altra microwave portable stand. They complain that it’s cheaply made, parts don’t fit well, and the paint peels off easily. One buyer comments that the boards cracked very easily, the holes in the board were not aligned correctly, and the plastic pegs broke off. Another unhappy purchaser states that the assembly process is too complicated and slow, and it requires definitely two people. A pleased user shared that this kitchen utility cart worked great in his office room, but for him, the provided screws and hardware wouldn’t keep it from wobbling, so he advised that you reinforce the base frame. A satisfied customer says that the oak kitchen cart rolls easily, the cabinet doors stay shut and don’t open. She states that the lower cupboard is perfect for storing her mixing bowls and bakeware and she is very happy with her purchase. If you are looking for a way to reorganize your kitchen and save some space, you might want to consider this beech microwave kitchen cart. Users love the compact size, the beautiful color and that it looks stylish and modern. However, some do note that it arrived damaged. With a size of 16 x 24 x 42 inches and a weight of 59.4 pounds, this wooden kitchen stand has a drawer for storing kitchen utensils, cabinet space for extra storage and wheels for easy mobility. Overall, it looks like an efficient kitchen stand, but a bit overpriced. Users have mixed opinions regarding this beech kitchen stand. They say that it’s a good rolling cart, but you shouldn’t expect a product of high quality or durability. One user shares that this microwave cart on wheels does a good job, but he doesn’t expect it to last a long time because the pieces are flimsy, and they crack and chip easily. Another customer stated it wasn’t very difficult to assemble the microwave utility stand, but it arrived with two cracked pieces. However, replacement parts were sent, and he liked how it looked. An unhappy customer also noted that the shelves were already broken when he received the package and the screws were missing. On the other hand, a satisfied buyer shared that it arrived in perfect condition, looked great and the doors and the drawer moved smoothly. When homeowners browse through the available microwave carts on the market today, they encounter a variety of different styles- some are bare-bones rolling racks assembled from metal piping while others are cupboard systems made of treated wood grain. In general, most reviewers were looking for a portable solution to help clean up some of the kitchen clutter that clogs the counter space and something that looks attractive, ideally matching the interior decor of their personal cooking areas. 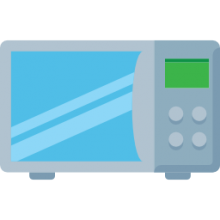 Many buyers prioritize purchasing microwave carts with storage, frequently visiting their local IKEA, Target or Lowes to discover microwave carts for sale- but often neglect online options because they assume that the shipping costs will be too high. This is a mistake as there are a variety of attractive microwave and kitchen carts available online at reasonable cost- with some of them including free-shipping. One of our favorite kitchen carts is the Whitmor Supreme- it is a wood and chrome option that features locking wheels and a removable top that functionally works as a butcher's block, or just an area to hold a large toaster or microwave. 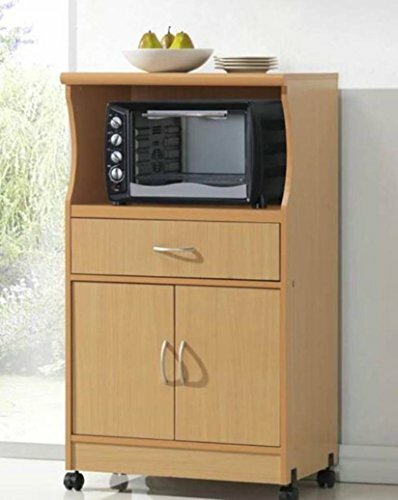 We did also like the Asia Direct microwave cart- with its buyers saying that it was easy to assemble, fairly sturdy, even when loaded with crockpots and rice cookers, features spacious shelving and includes a hideaway drawer which functions as a convenient hideaway for smaller utensils. Some users did experience trouble with this product- particularly with shipping, users said that often times it arrived damaged with parts missing. Several users said that they had trouble aligning the screws, which proved to be a frustrating issue. In general, savvy culinary obsessives are pretty smart about creating extra storage space in their kitchens- they often incorporate microwave carts into the equation to free up valuable counter space for cooking elaborate dinners and other meals for their family and guests. Smart kitchen organization often requires some planning and forethought. There are many innovative solutions you can look up online where ingenious individuals find the most creative ways to get the most space out of even the most cramped kitchen areas. Indeed, users say with the innumerable amount of appliances, cooking gadgets and cookware gizmos, the kitchen can be an incredibly frustrating space to organize. While many individuals find that microwave carts can provide a tremendous amount of storage capacity, other users supplemented by installing corner drawers, using an under sink drawer, installing pullout trash cans, creating nifty appliance garages, and designing pullout shelving. There are almost limitless ways of customizing your kitchen to create more space. Purchasing one is just one means of freeing up your counter and cabinetry from all of the complex kitchen gadgets that you probably don't even use!